St. Edmund Campion, born in London in 1540, was an outstanding student and orator from his early years. After schooling at St Paul's, and Christ Church, he entered St John's College, Oxford, where he studied philosophy, theology and the classics. Caught in the middle of the Elizabethan Reformation, he compromised his Catholic faith at University, took the Oath of Supremacy, and was ordained an Anglican deacon. After a change of heart and retreat into Ireland, he eventually went to Rome in 1573 to enter the Society of Jesus. In 1580 he was commissioned by the Jesuit General to minister to the persecuted Catholics in England. He returned to England in June 1580 and began a secret ministry, passing from home to home in thirteen counties, via an underground Catholic network. A nationwide man-hunt was out for him, but he evaded his pursuers and secretly printed his book, Ten Reasons, which caused a sensation across the country. Betrayed by a false Catholic, Campion was captured in July 1581, imprisoned in the Tower of London and tortured on the rack. On 1st December 1581, before an enormous crowd at Tyburn, he was fearlessly martyred by hanging, drawing and quartering. Now, recount the life of Edmund Campion, saint and martyr in this newly revised and definitive version from TAN Books. 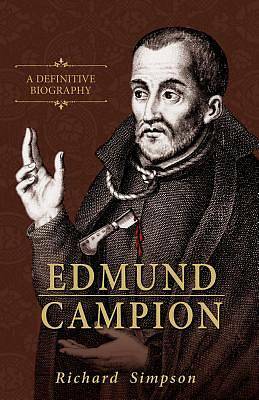 A new and updated life of St. Edmund Campion, Simpson's classic biography has been thoroughly revised and enlarged by Fr. Peter Joseph. With a foreword by Cardinal Pell.